Journal of Cardiovascular Medicine and Therapy is a peer-reviewed, scientific journal with an aim to provide rapid and reliable source of information on current discoveries and current developments in the field of cardiovascular. It aims to be an internationally leading journal which keeps cardiologist, internists and physicians up-to-date by publishing clinically relevant and evidence-based research. This Open access journal publishes quarterly issues containing original articles, review articles, case reports, short communications, etc. concerned with clinical aspects of cardiovascular and making them freely available through online without any restrictions or any other subscriptions to researchers worldwide. 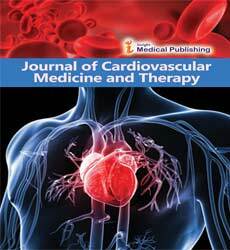 Journal of Cardiovascular Medicine and Therapy focuses on following topics but are not limited to: Atherosclerosis, Heart Attack, Ischemic Stroke, Cardiac ischemia, Plaque Attacks, Heart failure, Arrhythmia, Bradycardia, Tachycardia, Heart Valve problems, Angina, heart failure, Hypertensive heart disease, rheumatic heart disease, cardiomyopathy, heart arrhythmia, congenital heart disease, valvular heart disease, carditis, aortic aneurysms, peripheral artery disease, thromboembolic disease, and venous thrombosis. Cardiovascular Journals, Cardiovascular Research Journals, Cardiovascular Disorder Journals, Cardiovascular Journal List, Cardiovascular Disorders, Common Cardiovascular Disease, Cardiovascular Pathology Journal, Atherosclerosis: Open Access, Internal Medicine: Open Access, Current Synthetic and Systems Biology, Journal of Clinical & Experimental Cardiology, Atherosclerosis, Journal of Atherosclerosis and Thrombosis, Current Atherosclerosis Reports, Atherosclerosis Supplements, ARYA Atherosclerosis. Angiology: Open Access, Arrhythmia: Open Access, Journal of Cardiovascular Diseases & Diagnosis, Heart Failure Clinics, Current Heart Failure Reports, Heart failure monitor, JACC: Heart Failure, Journal of Congestive Heart Failure and Circulatory Support.Ischemic stroke. Ischemic stroke can be divided into two main types: thrombotic and embolic. Deprived of oxygen and other nutrients, the brain suffers damage as a result of the stroke. A thrombotic stroke occurs when diseased or damaged cerebral arteries become blocked by the formation of a blood clot within the brain. Stroke, Topics in Stroke Rehabilitation, International Journal of Stroke, Journal of Stroke and Cerebrovascular Diseases, Translational Stroke Research, Experimental and Translational Stroke Medicine, Stroke Research and Treatment, Journal of Experimental Stroke and Translational medicine, Seminars in Cerebrovascular Diseases and Stroke, Jsournal of Neurological Disorders & Stroke. Cardiac ischemia refers to lack of blood flow and oxygen to the heart muscle. Cardiac ischemia happens when an artery becomes narrowed or blocked for a short time, preventing oxygen-rich blood from reaching the heart. Circulation, Hypertension, The New England Journal of Medicine, American Journal of Critical Care, Journal of The American Heart Association, Journal of the American Heart Association Cardiovascular and Cerebrovascular Disease, Journal of Clinical Investigation, Mediators of Inflammation. Heart failure (HF), often referred to as congestive heart failure (CHF), occurs when the heart is unable to pump sufficiently to maintain blood flow to meet the body's needs. Signs and symptoms commonly include shortness of breath, excessive tiredness, and leg swelling. The shortness of breath is usually worse with exercise. Angiology: Open Access, Arrhythmia: Open Access, Journal of Cardiovascular Diseases & Diagnosis, European Journal of Heart Failure, Heart Failure Reviews, Heart Failure journal, Circulation: Heart Failure, Congestive Heart Failure, European Journal of Heart Failure, Journal of Cardiovascular surgery, Journal of Cardiothorasic surgery, Cardiovascular surgery journals. Journal of Arrhythmia, International Journal of Arrhythmia, Official Journal of Japanese Heart Rhythm, Society and Asia Pacific Heart Rhythm Society, Asia Pacific Heart Rhythm Society, Japanese Heart,Rhythm Society, Cardiovascular Pathology: Open Access, Journal of Hypertension: Open Access, Journal of Clinical & Experimental Cardiology, Arrhythmia: Open Access, Arteriosclerosis, Thrombosis, and Vascular Biology, JACC: Cardiovascular Interventions, Circulation: Arrhythmia and Electrophysiology. American Journal of Critical Care, Circulation: Arrhythmia and Electrophysiology, The American Academy of Insurance Medicine, Journal of Arrhythmia, The American Journal of Emergency Medicine, The New England Journal of Medicine, Journal of Pediatric Haemotology/Onclolgy, International Journal of Cardiology. Tachycardia is a common type of heart rhythm disorder (arrhythmia) in which the heart beats faster than normal while at rest. The American journal of medicine, The Medical Journal of Australia, Journal of the American, Journal of Emergency Medical Services, Journal of American College of Cardiology, Journal of the American Acdemy of Physician Assistants, The Journal of Family Practice. Chest pain or palpitations (rapid rhythms or skips) Shortness of breath, difficulty catching your breath, fatigue, weakness, or inability to maintain regular activity level. Lightheadedness or loss of consciousness. Swollen ankles, feet or abdomen. The Journal of Heart Valve Disease, American Heart Association, The Medical Journal of Australia, Circulation, American Journal of Roentology. Angina Angina is chest pain or discomfort caused when your heart muscle doesn't get enough oxygen-rich blood. It may feel like pressure or squeezing in your chest. The discomfort also can occur in your shoulders, arms, neck, jaw, or back. Angina pain may even feel like indigestion. Vascular Medicine & Surgery, Blood, Blood & Lymph, Blood Disorders & Transfusion, Insights in Blood Pressure, Journal of Hypertension: Open Access, Arrhythmia: Open Access, Chest, Clinics in Chest Medicine, Monaldi Archives for Chest Disease, Manchester School, Indian journal of chest diseases & allied sciences, Japanese Journal of Chest Diseases, Chest Disease Reports. Hypertensive heart disease refers to heart conditions caused by high blood pressure. The heart working under increased pressure causes some different heart disorders. Hypertensive heart disease includes heart failure, thickening of the heart muscle, coronary artery disease, and other conditions. Hypertensive heart disease can cause serious health problems. It’s the leading cause of death from high blood pressure. Cardiology Journals: Angiology: Open Access, Arrhythmia: Open Access, Journal of Cardiovascular Diseases & Diagnosis, Arteriosclerosis, Thrombosis, and Vascular Biology, Stroke, Journal of American Heart Association, AHA Journals, Cardiovascular journal, Clinical Cardiology, Americal Journal of Cardiology. Rheumatic heart disease (RHD) is damage to one or more heart valves that remains after an episode of acute rheumatic fever (ARF) is resolved. It is caused by an episode or recurrent episodes of ARF, where the heart has become inflamed. The heart valves can remain stretched and/or scarred, and normal blood flow through damaged valves is interrupted. Blood may flow backward through stretched valves that do not close properly, or may be blocked due to scarred valves not opening properly. Journal of Cardiovascular Diseases & Diagnosis, International Journal of Cardiovascular Research, Cardiovascular Pathology: Open Access, American Journal of Preventive Medicine, Trends in Cardiovascular Medicine,The Open Cardiovascular Medicine Journal.,The Lancet. Cardiovascular Pathology: Open Access, Journal of Clinical & Experimental Cardiology, Insights in Pediatric Cardiology, International Journal of Cardiovascular Research, Cardiovascular Pharmacology: Open Access, Congenital Heart Disease, World journal for pediatric & congenital heart surgery, American Heart Journal, European Journal of Heart Failure, Heart Rhythm, Journal of Heart Valve Disease, Circulation: Heart Failure, Heart and Lung: Journal of Acute and Critical Care, International Heart Journal, Heart Surgery Forum, Congestive Heart Failure, Congenital Heart Disease. Valvular heart disease is characterized by damage to or a defect in one of the four heart valves: the mitral, aortic, tricuspid or pulmonary. The mitral and tricuspid valves control the flow of blood between the atria and the ventricles (the upper and lower chambers of the heart). The Journal of Heart Valve Disease, Journal of the American Heart Association, The British Journal of Cardiology, Circulation, The British Journal of Cardiology, Journal of Structural Heart Disease, American College of Cardiology. Cardiovascular Journals, Cardiovascular Research Journals, Cardiovascular Disorder Journals, Cardiovascular Journal List, Cardiovascular Disorders, Common Cardiovascular Disease, Cardiovascular Pathology Journal, Journal of Vascular Medicine & Surgery, International Journal of Cardiovascular Research, Cardiovascular Pharmacology: Open Access, Journal of Clinical & Experimental Pathology, Netherlands Heart Journal, Heart Failure Clinics, Journal of the American Heart Association, Global Heart, World Heart Journal. An aortic aneurysm (say "a-OR-tik AN-yuh-rih-zum") is a bulge in a section of the aorta, the body's main artery. The aorta carries oxygen-rich blood from the heart to the rest of the body. Because the section with the aneurysm is overstretched and weak, it can burst. Peripheral artery disease (P.A.D.) is a disease in which plaque builds up in the arteries that carry blood to your head, organs, and limbs. Plaque is made up of fat, cholesterol, calcium, fibrous tissue, and other substances in the blood. This article focuses on P.A.D. that affects blood flow to the legs. Journal of Invasive Cardiology, Cardiovascular Journals, Cardiovascular Research Journals, Cardiovascular Disorder Journals, Cardiovascular Journal List, Cardiovascular Disorders, Common Cardiovascular Disease, Cardiovascular Pathology Journal, Advanced Techniques in Biology & Medicine, Anatomy & Physiology: Current Research, Journal of Clinical & Experimental Cardiology, International Journal of Cardiovascular Research, Coronary Artery Disease, Artery Research, Artery. Thrombosis – An Open Access Journal, Journal of Hematology & Thromboembolic Disease, Journal Arthroplasty, Journal of Vascular and Interventional Radiology, Thrombosis Journal, Journal of Thrombosis and Haemostasis, Journal of Thrombosis and Thrombolysis, Journal of Thrombosis and Circulation. A venous thrombus is a blood clot (thrombus) that forms within a vein. Thrombosis is a term for a blood clot occurring inside a blood vessel. A common type of venous thrombosis is a deep vein thrombosis (DVT), which is a blood clot in the deep veins of the leg. Thrombosis Journal,Journal of Vascular Surgery,The Journal of the American Medical Association,Cardiovascular Pathology: Open Access, Journal of Hypertension: Open Access, Journal of Clinical & Experimental Cardiology, Arrhythmia: Open Access, Arteriosclerosis, Thrombosis, and Vascular Biology, JACC: Cardiovascular Interventions, Circulation: Arrhythmia and Electrophysiology.